Local playwright Bill Cook has been known for plays about men in nightmarish situations. In two of his previous works (Love in an Age of Clamor and The Promised Land), the nightmare was mainly financial in nature, but a woman also played a role. It seems that in Cook’s world, as in real life, romantic relationships can be both complicated and precarious. 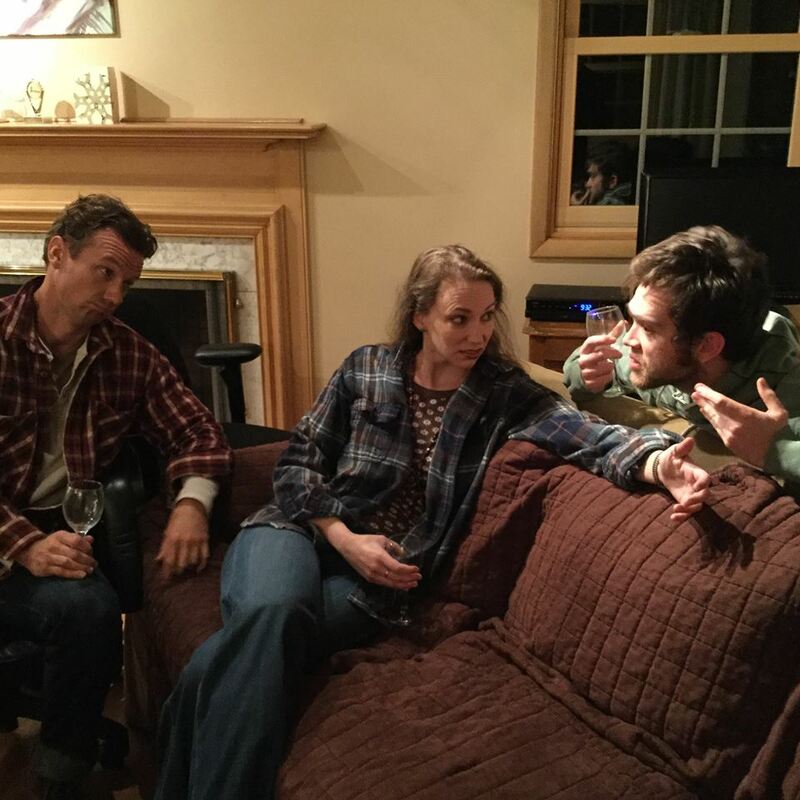 In his new play, Devotion, those relationships move to center stage. Set in New York City, it’s about Tricia (Beth Josephsen), a struggling artist with two men in her life: current boyfriend James (James Harper), a video artist; and former boyfriend Alex (Danny Turek), an actor. As the play begins, both James and Alex are sharing Tricia’s loft, but Alex keeps promising to move out as soon as he finds a new place. This irks James, who suspects Alex is biding his time while he looks for ways to con his way back into Tricia’s good graces. And his distrust seems justified, especially after Alex claims he’s met an art buyer who can help boost Tricia’s career. Who will end up with Tricia? It’s hard to feel we have a horse in this race, as we don’t particularly like any of the characters. However, we may well recognize them, as Cook injects their interchanges with verbal slings and arrows that many will find wincingly familiar. Director Pamela Hill builds on the script’s strengths by encouraging the actors to dive headfirst into their characters. On opening night, Harper gave the most understated performance as James—to the extent that, at times, it seemed he had yet to fully invest in the character. Turek started out with the opposite problem, overplaying his first scene. Overall, though, he gave a spirited and entertaining interpretation of the glib, conniving Alex. Even more impressive is Josephsen’s performance, despite an occasional tendency to mumble her lines. Whether Tricia is keeping Alex’s advances in check or greeting James’s pronouncements with maternal disapproval, she creates a convincing portrayal of a woman who likes to be in control. Though Devotion differs from Cook’s earlier works in some ways—for example, the tone is naturalistic rather than surreal—it retains the previous plays’ cinematically short scenes. This means the action has to stop every few minutes while stagehands adjust Peter Pauze’s appropriately realistic scenery. The pauses would be more of a distraction if the interludes weren’t accompanied by well-chosen mood music. Another, more unfortunate, way in which Devotion resembles other Cook plays I’ve seen is that its ending doesn’t quite work. At least, it doesn’t quite work for me. At a certain point, two of the three characters begin acting in ways that make no psychological sense. I can hazard a guess as to why Cook has them behave this way, but sorry, I’m just not buying it. Until the final scene, however, Devotion is a low-key but interesting take on the Battle Between the Sexes. A&B Theatricals will present Devotion through Nov. 14 at MadLab Theatre, 227 N. Third St., Columbus. Show times are 8 p.m. Thursday-Saturday. Running time: 1 hour, 35 minutes (including intermission). Tickets are $15, $12 for students and seniors. 614-441-2929 or ab-theatrical.com. Simon can’t quite bring himself to go to work. He just can’t shake the premonition that something bad is about to happen. As it turns out, his premonition is correct. His boss is getting ready to “restructure” him out of the job to which he’s devoted more than 20 years of his life. Thus begins The Promised Land, a comedy about a baby boomer’s worst nightmare. The one-act is the latest work from local playwright Bill Cook. Like Cook’s 2012 offering Love in an Age of Clamor, this is the story of a middle-aged man facing a sudden loss. At age 55—too early to retire but too late to be attractive to many employers—the financial analyst finds himself back on the job market. Also like Clamor, The Promised Land is devised as a “dream play,” meaning it’s a fast-moving chain of events that don’t always resemble reality. There’s a subtle difference, though. Clamor was more or less surreal throughout, but The Promised Land has isolated moments of surrealism that are explained away as dreams or even hallucinations. The rest of the time, it’s more like a hyperactive version of real life. Personally, I found the earlier approach more entertaining, but that’s partly because I’m a fan of surrealists such as 20th century Spanish director Luis Buñuel. Viewers who are more down-to-earth may feel otherwise. In any case, both of Cook’s works share a playful approach that incorporates a slew of lively supporting roles. In the current production, Jeff Horst portrays all of them and makes the most of the opportunity. For instance, he incorporates witty bits of business as a potential employer who appears in two very different states of being—as a shot-downing bar patron and as his morning-after counterpart, who gulps down coffee like it’s crucial to his survival. Director Joe Bishara also encourages Josie Merkle to stretch her acting muscles as Simon’s wife, especially during a (possibly) hallucinogenic scene in which she takes a job as a cocktail waitress. As Simon, Nick Baldasare projects the appropriate amounts of confusion, terror and determination. He makes the job seeker a fairly sympathetic figure even though Simon doesn’t always behave in ways that will be relatable to many viewers. In particular, he exhibits an outdated patriarchal attitude toward Grace, as when she seeks to boost the household income by taking a job. Add an ending that doesn’t quite wrap things up, and you have a play that fails to reach its full potential as a parable of contemporary paranoia. Fortunately, none of this prevents the comedy from scoring as a showcase for its talented cast. A&B Theatricals will present The Promised Land at 8 p.m. today and Saturday (March 29-30) at the Columbus Performing Arts Center, 549 Franklin Ave. in Downtown Columbus. Running time: 1 hour, 30 minutes. Tickets are $12, $8 for students. For reservations, visit brownpapertickets.com. For more information, visit ab-theatical.com. More and more, creative types are refusing to let rejection hold them back. Then there’s Bill Cook, Columbus State professor and fledgling playwright. When he was ready to stage an original comedy called Love in an Age of Clamor last year, he figured he might as well produce it—i.e., make the necessary arrangements and put up the money—himself. His reasoning was that it would be difficult to find a theater troupe that wanted to take a chance on a new work by an unknown playwright. “If you do a work that’s already been done—you know, already has press, people know of it—it’s less risky to do,” he said. So, rather than look around for a troupe that was willing to try something untried, he formed his own theater company and booked space at the Columbus Performing Arts Center. He even planned to direct the play himself, but then he ran into a snag: He couldn’t find a cast. “I didn’t know any actors, and nobody showed up to the audition,” Cook said. Luckily for him, the person in charge of managing the venue was Joe Bishara, associate artistic director of CATCO and an experienced thespian. Even more luckily, Bishara took an interest in the project. The upshot was that Love in an Age of Clamor was performed last spring, with Nick Baldasare leading a cast of three. It apparently was enough of a success that Cook and his company, A&B Theatricals, are now back with another original play called The Promised Land. 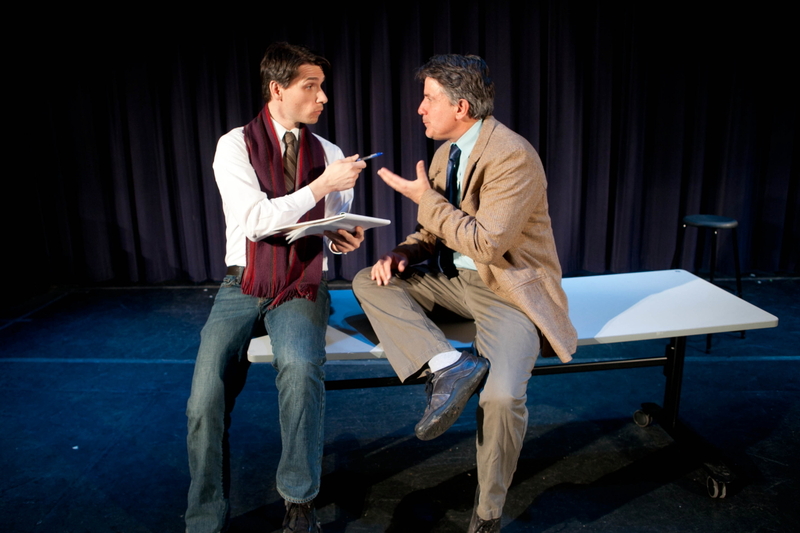 Opening tonight at CPAC, the play reunites director Bishara with leading man Baldasare. Filling out the cast are Josie Merkle as Baldasare’s wife and Jeff Horst as assorted other characters. Another similarity to the previous work: Like Clamor, it’s a “dream play,” which means it unfolds with the not-quite-real logic of a dream. He added that it also allows him to move events along at a fast clip. “I like a lot of action in plays, whether they’re mine or others’,” he said. Still another similarity to Clamor: In that play, Baldasare’s character lost his home and, possibly, his marriage. In this one, he loses his job. Why is Cook so fascinated by the theme of loss? And like Anton Chekhov, Cook has more than two plays in him. He’s already working on yet another dream play about yet another kind of loss. A&B Theatricals will present The Promised Land March 22-30 at the Columbus Performing Arts Center, 549 Franklin Ave. in Downtown Columbus. Show times are 8 p.m. today and Saturday, 2 p.m. Sunday and 8 p.m. Thursday through March 30. Tickets are $12, $8 for students. For reservations, visit brownpapertickets.com. For more information, visit ab-theatical.com.